Apple changed the world (kind of). The last 20 years PCs did rule the world since last month. The first time ever more mobile devices than PC and notebooks were sold. 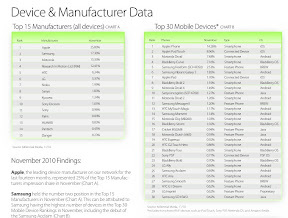 And Apple not only started the hype with the iPhone but also has a big market share of over 25%. The PC market will this year only grow 18% instead of 40% like in the years before and only because of smart phones and tablets. Apple never made it into PC market, the market share is only 5% and mainly because they never made it into businesses. Dell and Windows do dominate the business world. Apple is now trying to change this with mobile devices, they know the future is mobile and started Thursday their JointVenture to get early their feet into businesses. 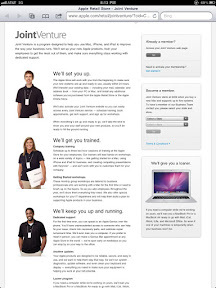 JointVenture allows companies to get their employees trained on Apple devices. Apple will set up the employees, train them and offers dedicated support. But of course this comes with a price. Apple is charging $499 for up to 5 users and $99 for each additional user/year. It seems Apple is targeting small companies which have no IT department. But when you think deeper it even makes sense for big companies who have no IT knowledge for MacOs or iOS. it might look expensive, but Apple offers special IT training that big companies only need to sign up their IT department. That $500 is also on top of the 3-year Applecare (not instead of), but retail employees were told that they business customers could receive enough in discounts to offset some, if not all of the price of JointVenture. What does that $500 really buy you? Genius Bar phone calls. Joint Venture customers can now call in support “geniuses” which will be business-focused call center employees. If repairs take more than 24 hours, you get a loaner computer. Apple is the first company which is offering this for mobile devices (if we don't count blackberry). At least it is a big advantage to Google and Android. And right now in mobile there are only Blackberry, Android and Apple iOS. We will see how it works out but it is at least a step in the right direction. It will the day come when mobile devices are as common or more common than PCs and who ever leads the business world (in terms of OS) will then win the private sector as well. Consumers buy at the end their new devices which they know the software the best or what they use in the office.